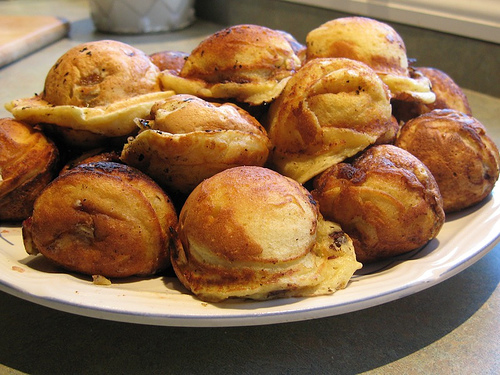 I was given an ebelskiver pan several years ago. I’m generally opposed to pans that only do one thing, perhaps because I am a New Yorker, which is synonymous with being a Less Spacer. But I was intrigued, and I now have a habit of making ebelskivers every New Year’s Day. What are these damn things? you ask. They sound wobbly. Like edible jokes. Edible jokes on skewers. They are a Danish dessert filled with bits of apple, I reply. But I pretend they are breakfast food, like a little round pancake donut combo, and I fill them with jam, Nutella, apple, banana, or some combinations of those things. The mode of creating them is to create a buttermilk batter, get the pan hot, put butter in each of the 7 half circle divots, add a bit of batter, add a smidge of filling, and then add more batter on top. Let each one firm and color a little in the pan and then twirl what is becoming a burnished little ball with a chopstick or knitting needle to cook the other side. Shake a bit of powdered sugar on at the end, and life seems pretty much perfect. My new trick is to put them into an oven set to about 220 to keep them warm, and then serve a gigantic pile at once, rather than meting them out. It’s more exciting, too, when you approach the pile unsure of which sort of filling you will get. No one can say that I don’t lead an exciting life. 1. Beat eggs whites until stiff. I used to think this was a big deal, because I was doing it with my KitchenAid mixer, which very heavy and has grippy feet AND is kept under the counter, and it’s nearly impossible to get out quietly, and since I am always trying to get or keep someone sleeping, it was prohibitive. Now I use my immersion blender whisk attachment and it’s actually fast and fine. 2. In a second bowl—one that is rather large—mix together all of the white powders. Then all add of the yellow substances, and the buttermilk. Stir all together until smooth. 3. Fold in the egg whites. This requires quite a bit of folding. 4. Heat butter in the divots of the pan. Put in a bit less than one tablespoon per divet. When it is hot, add a bit of batter — less than you want to. Add a bit of filling and top it off. Turn gently with a chopstick. Cook slowly so that the outside gets browned but that the inside also gets cooked. Serve immediately or keep a pile warm in the oven for a heaping, majestic presentation. As with most other foods, these go wonderfully with breakfast sausage or bacon. Made these this morning. Despite many pitfalls (frozen buttermilk overwarmed in the microwave, bowl too big for the whisk attachment to reach the egg whites in the bottom of the kitchen aid, nosy 4 year old poking at everything) they turned out great! Thanks for reminding me to use that pan collecting dust in our cabinet. OK, so where does one find the pan? They look pretty impressive. Hello Ann! I think they have them at William’s Sonoma. And I recently ordered one for someone from Amazon.com. I think that you want to be sure that the handle is not getting enormously hot — ie, not cast iron (though I am a cast iron devotee) because you will have to perhaps hold the handle in order to use a chopstick to twist the pancakes. But there are lots of models and they are not too expensive!